Sample preparation is a crucial step in the analysis process and the kinetics of dissolution must be considered when introducing solid state polymers into a solvent. Measuring prior to complete solvation of the polymer chains can produce artifacts in the viscosity data that lead to misinterpretation. We discuss the preparation and viscosity measurement of nylon 66 in formic acid, but the concepts can be applied to other polymer/solvent systems. The process of polymer dissolution and the relevant parameters. Artifacts that may be observed in the microfluidics based viscosity measurement if measured too soon. Viscosity data on polymer solutions allowed to reach a fully solvated state. 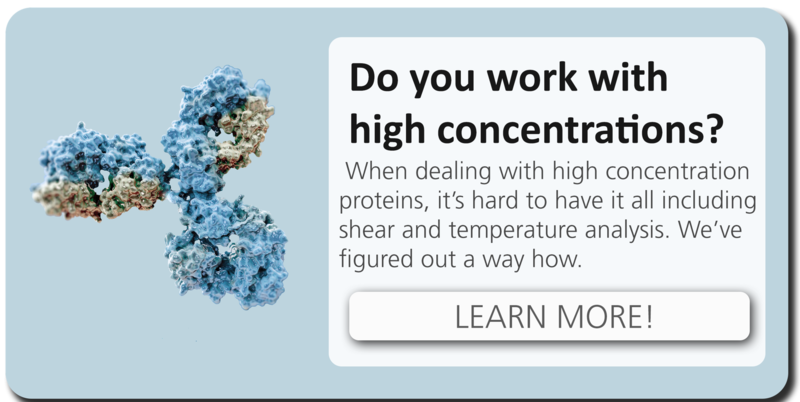 Do you work with high concentration proteins? Download our application note on how you can do various temperature dependent viscosity tests with your limited sample!